Ah, the bliss of ignorance. Oh, but that I were able to get excited about the People's Climate March, "the largest climate march in history," today. But I just can't, not when the march is actually calling for nothing more than, well, for people to march. 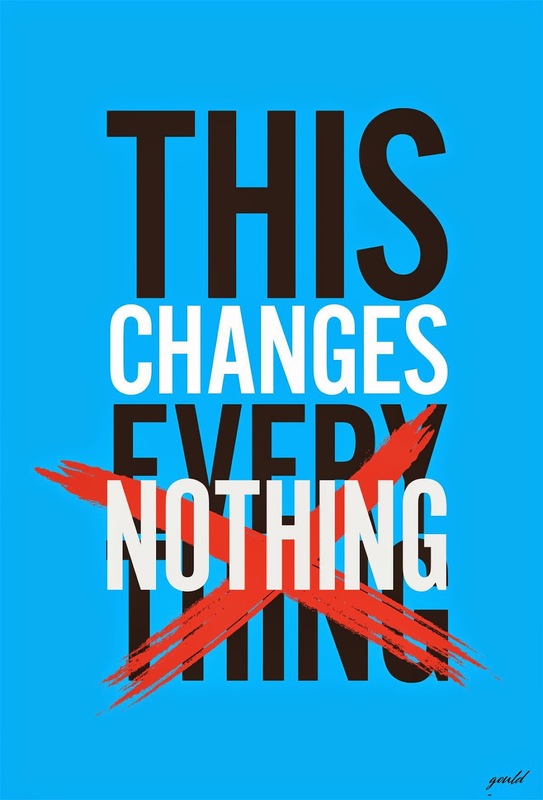 I don't like being cynical, but there's far too much evidence this time that the whole thing is about good P.R., not about safeguarding the future or convincing governments to take urgent action on climate change (or especially outlining what that urgent action could be). Keep in mind that back in June of of this year, Climate Action Network (CAN) International, representing 900 organizations in 100 countries, many or most of them in the more vulnerable regions, released the best-ever climate emergency response position statement: a limit of 1.5ºC or less, not the deadly 2ºC "target"; greenhouse gas emissions declining by next year, 2015; and a rapid transition to 100% clean, renewable energy — in other words, achieving a zero-carbon economy — by 2050 or sooner. But no one in the Global North is promoting the CAN International position statement. Why is that? Indeed, it almost seems as though this march was designed to divert our attention from CAN's demands of our governments — demands that could actually make a difference. "Perfect Timing World leaders will be gathered in NYC for a landmark U.N. climate meeting — just the right moment for big public pressure." Oh really? No, world leaders are meeting on Tuesday, so they won't be "gathered in NYC" on Sunday, like a bunch of conventioneers showing up early for a bit of debauchery before a conference. Timing-wise, Monday's Flood Wall Street march might have a bit more impact. "Massive Scale We'll peacefully flood the streets in historic numbers, both in New York City and in solidarity events around the world." Um, I thought George Dubya Bush taught us that peacefully marching in the streets is worth nothing and accomplishes nothing. Millions of us held candlelight vigils begging him not to illegally invade Iraq, but he laughed and snubbed his nose at us and went in anyway, making life hell for millions of Iraqis as well as American and British soldiers. Oh, and just to make sure we understand what the organizers mean by "peacefully": "NOTE: This march route was set after several months of negotiating with the New York Police Department...."
"Unprecedented Collaboration - Over 1,500 (!) businesses, unions, faith groups, schools, social justice groups, environmental groups and more, all working together.... We want to make sure the People's Climate March tells the story of today's climate movement in all its parts — so we're trying something new, and arranging the contingents of the march in a way that helps us thread our many messages together." I've been told they're paying young people from as far away as Toronto to attend to create that collaboration. And I notice they're keeping the LGBTQ community as far away from the kids and families as they can, without insulting the Indigenous peoples and those impacted by Hurricane Sandy who are at the head of the parade, er, march. Centered on Justice - Committed to principles of environmental justice and equality — representing the communities that are being hit the hardest by climate change. And not to be unkind or insensitive, but is there something about the living and working conditions of domestic workers in the United States that I'm not aware of? Are nannies in Philadelphia being impacted by climate change more than other Philadephians, for example? "With our future on the line and the whole world watching, we'll take a stand to bend the course of history. 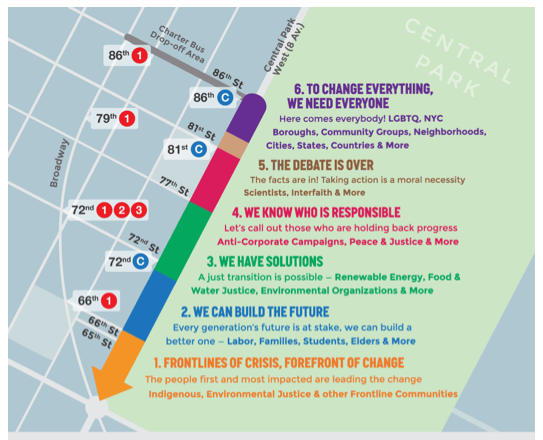 We'll take to the streets to demand the world we know is within our reach: a world with an economy that works for people and the planet; a world safe from the ravages of climate change; a world with good jobs, clean air and water, and healthy communities." Well, at least I'm not the only cynic about this People's Climate March. Arun Gupta writes in Counterpunch: "I've never been to a protest march that advertised in the New York City subway. That spent $220,000 on posters inviting Wall Street bankers to join a march to save the planet, according to one source. That claims you can change world history in an afternoon after walking the dog and eating brunch." What does he find most troubling? "Having worked on Madison Avenue for nearly a decade, I can smell a P.R. and marketing campaign a mile away. That's what the People's Climate March looks to be." Cory Morningstar, at Wrong Kind of Green, says: "The People's Climate March and supporting discourse is about protecting capitalism, not protecting the world's most vulnerable people from climate change. [It] is a mobilization campaign created by Avaaz and 350.org, with 350.org at the forefront. The oligarchs do not bankroll such a mobilization (via millions of dollars funnelled through foundations) without reason." Anne Petermann, writing for Daily Kos, agrees that there is no call for action: "So, what are the demands of the march? There are none. That's right. The march will simply bring together an estimated 200,000 people to march through the streets of New York and then… There will be no rally, no speakers, and no strong political demands. Just people showing up with the overarching message that the world's leaders should take action on climate change. Why no solid demands?" Quincy Saul writes in Truthout: "No Target: The march is a U-turn through Times Square, beginning at a monument to genocide (Columbus Circle) and ending ... in the middle of nowhere. Here in New York City where the ruling class of the whole world has made their diverse headquarters, the march will target none of them. The march will not even go near the United Nations, its ostensible symbolic target. No Demands: Again, to attract the largest number of people, the march has rallied around the lowest common denominator — in this case, nothing. Not only are there no demands, but there is in fact no content at all to the politics of the march ...."
But I'm sure that if it doesn't rain too hard and nobody's dog gets stepped on, it will be a nice event.